Earlier this year I introduced KPK readers to the work I’m doing to collate and annotate as much scholarly information about Hallyu as I can. Without further ado, I share with you the first section, focusing on books covering Hallyu. Subsequent parts of this series will be identified by SUBJECT rather than format. Please note that these entries are listed by year, starting with 1991 (TIP: If you know about a title or author and you want to see if it’s included in this listing, use the CTRL +F function). Various book covers. Credit to respective publishers. Kang, Hyun Do. (1991). Media culture in Korea. Seoul: Seoul National University Press. Chua, Beng Huat. (2000). Consumption in Asia: lifestyles and identities. London: Routledge. Craig, Timothy J. & King, Richard. (2002). Global goes local. Vancouver, B.C. : University of British Columbia Press. Cho, Hae Joang, Sangmin, Hwang, Koichi, Iwabuchi, Lee, Dong-Hu, & Kim, Hyunmi . (2005). Korean wave and popular culture in Asia. Seoul: Yonsei University Press. Choe, Jin-bong. (2003). Korean mass media and popular culture. Jung-Gu: Woojinadcom, Inc.
Lau, Jenny Kwok Wah. (2003). Multiple modernities: cinemas and popular media in transcultural East Asia. Philadelphia: Temple University Press. Baek, W. (2005). Korean Wave: The Cultural Choice of East Asia. Seoul: Pentagram. Kim, Jasper. (2005). Crisis and Change: South Korea in a Post 1997 New Era. Seoul: Ewha Womans University Press. Kim, Youna. (2005). Women, television, and everyday life in Korea. London: Routledge. Bruns, Axel et al. (2006). Living in Cy-world: Contextualising Cy-Ties in South Korea. Peter Lang (Publisher). Howard, Keith. (2006). Korean pop music: Riding the wave. Honolulu: University of Hawai’i Press. Huat, Chua Beng and Koichi, Iwabuchi (Eds.). (2008). East Asian Pop Culture: Analyzing the Korean Wave. Aberdeen: Hong Kong University Press. Kim, Youna (ed.). (2008). Media consumption and everyday life in Asia. New York: Routledge. Sung, Sang-yeon, Yasmin Lee G. Arpon, Jennifer Pai & The Korea Herald. (2008). Korean wave. Jimoondang. Choy, Christine. (2009). Cinema Korea. New York: Filmmaker’s Library. Connor, Mary. (2009). The Koreas. Santa Barbara: ABC-CLIO. Llora, Miguel. 2009. 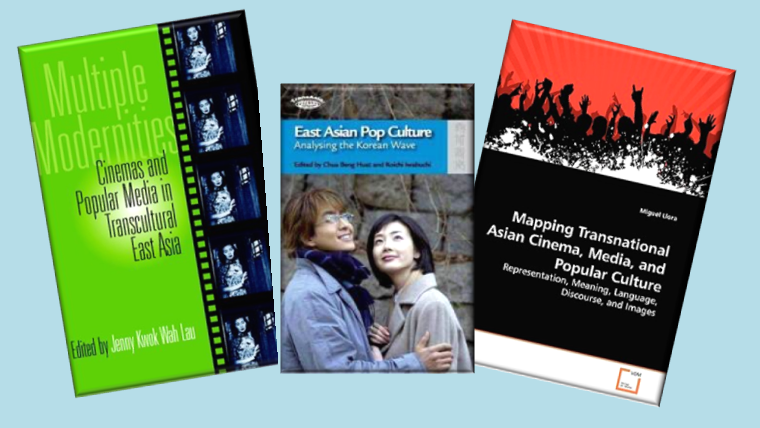 Mapping transnational Asian cinema, media, and popular culture: Representation, meaning, language, discourse, and images. Saarbrücken: VDM Verlag. Park, Duk-soo. (2009). Global Korea: old and new: proceedings from the Sixth Biennial Conference Korean Studies of Australasia. The Association. Russell, Mark James. (2009). Pop goes Korea: Behind the revolution in movies, music and internet culture. Berkeley: Stone Bridge Press. Lo, Kwai-Cheung. (2010). Excess and Masculinity in Asian cultural productions. Albany: State University of New York. Shim, Doobo, Heryanto, Ariel & Siriyuvasak, Ubonrat. (2010). Pop culture formations across East Asia. Seoul: Jimoondang. Choi, Joon Sik. (2011). Understanding contemporary Korean culture. Seoul: Ewha Womens University, Korean Cultural Research Institute. Chung, Ah-young & Haeoe Hongbowon. (2011). K-drama: A new TV genre with global appeal. Seoul: Korean Culture and Information Service. Kim, Do Kyun & Kim, Min-Sun. (2011). Hallyu: The influence of Korean popular culture in Asia. Seoul: Seoul National University Press. Kim, Kyung Hyun. (2011). Virtual Hallyu: Korean cinema of the global era. Durham: Duke University Press. Leto, Jacquelyn. (2011). A Look at K-pop boy bands, girl groups and the big three entertainment labels. Websters’ digital services. Leto, Jacquelyn. (2011). Asian Invasion! The Korean wave of popular culture washes upon many shores: Kpop. Webster’s Digital Services. Chua, Beng Huat. (2012). Structure, audience, and soft power in East Asian popular culture. Hong Kong: Hong Kong University Press. Kim, Chang Nam. (2012). K-POP: Roots and blossoming of Korean popular music. Elizabeth: Hollym International Corp. Lent, John A. & Lorna Fitzsimmons. (2012). Asian popular culture: New, hybrid, and alternate media. Lanham: Lexington Books. Fitzsimmons, Lorna & John A. Lent. (2013). Popular culture in Asia: Memory, city, celebrity. New York: Palgrave Macmillan. Jung, Kim Su, Kalinga Seneviratne& Madanmohan Rao. (2013). Evolving Asian culture gateways: The Korean wave and beyond. Singapore: Asian Media Information and Communication Centre. Kim, Youna. (2013). The Korean wave: Korean media go global. London: Routledge. Otmazgin, Nissim & Eyal Ben-Ari. (2013). Popular culture co-productions and collaborations in East and Southeast Asia. Singapore: NUS Press. Hong, Euny. (2014). The birth of Korean cool: How one nation is conquering the world through pop culture. New York: Picador. Kallen, Stuart A. (2014). K-pop: Korea’s musical explosion. Minneapolis: Twenty-first Century Books. Kim, Jeongmee. (2014). Reading Asian television drama: Crossing borders and breaking boundaries. London: Tauris. Kuwahara, Yasue. (2014). The Korean wave: Korean popular culture in a global context. New York: Palgrave Macmillan. Kyung, Hyun Kim & Youngmin Choe. (2014). The Korean popular culture reader. Duke: Duke University Press. Lie, John. (2014). K-pop: Popular music, cultural amnesia, and economic innovation in South Korea. Oakland: University of California Press. Ryoo, Woongjae. (2014). Global mediascape and the cultural hybridity: the case of the Korean wave. Saarbrucken: Scholars’s Press. Tudor, Daniel. (2014). A geek in Korea: Discovering Asia’s new kingdom of cool. Tuttle Publishing. Choi, Jungbong & Roald Maliangkay. (2015). K-pop: The international rise of the Korean music industry. New York: Routledge. Lee, Sangjoon & Markus Nornes. (2015). Hallyu 2.0: the Korean wave in the age of social media. Ann Arbor: University of Michigan Press. Marinescu, Valentina. (2015). The global impact of South Korean culture: Hallyu unbound. Lanham: Lexington Books. University of Hildesheim. (2015). Globalization and popular music in South Korea: Sounding out K-pop. New York: Routledge. Wen, Xen Lim. (2015). Hallyu power: Cultural policies of the South Korean government. Singapore: East Asian Institute. Choe, Youngmin. (2016). Tourist distractions: Traveling and feeling in transnational Hallyu cinema. Ann Arbor: University of Michigan Press. Dal, Yong Jin. (2016). New Korean wave: Transnational cultural power in the age of social media. Urbana: University of Illinois Press. Dave, Shilpa, LeiLani Nishime, & Tasha G. Oren. (2016). Global Asian American popular cultures. New York: New York University Press. Jackson, Andrew David & Colette Balmain. (2016). Korean screen cultures: Interrogating cinema, TV, music, and online games. Oxford: Peter Lang. Is Collaboration the Only Way to Do DH?